There’s no denying that Disney’s Lemonade Mouth has got kids across American rocking out and loving music--and now you can take it home with you on DVD or Blu-ray! We got a chance to catch up with Bridgit Mendler and Adam Hicks to ask them about their experience in the band, and what they're doing now! Adam has a summer time song with Disney in the works called Burn it Up! Kidzworld: Adam, you’ve been performing for a long time, both acting and musically, how was Lemonade Mouth different from projects you’ve done in the past? 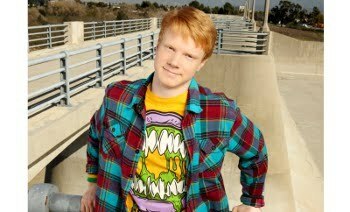 Adam Hicks: Lemonade Mouth is different in a lot of ways, but its different for the biggest reason because I got to combine my two passions of acting and music into one project, I’ve been working on a zany television show called Zeke and Luther and so it was different as an actor to really show the transition and jump into this other character. I’ve never done anything like this, a story about a rock band, we filmed it in New Mexico and I’ve never been out to New Mexico. KW: How did you get the part in Lemonade Mouth? Bridgit: I auditioned for my role in Lemonade Mouth I think three times, the first time they brought me in they had me read for Stella as well, and then after that I was just focussing on Olivia, and it was a big difference from my usual sitcom character. I had to definitely tone things down but it was really fun and I definitely enjoyed the process. KW: When did you first know you wanted to be a performer? Adam: I always liked to perform, I would always perform for my parents and at school I was involved in a play, a Tom Sawyer play and right after that I got picked up by a local agency and started doing local stuff in Las Vegas. I’ve been acting for like 11 years now and I really just enjoy the craft and enjoy playing people. All the great people I meet, all the great places I’ve been too, it’s amazing. Bridgit: I was 11 when I did a play out in Northern California and I really enjoyed it and I decided that I wanted to pursue a career and so I got an agent and did commercials and voice-overs and that sort of thing and then I decided that I wanted to do it for real, so I got my agent down in LA and did my little bit on General Hospital and eventually it all worked out and Disney has been a really great home for me. They’ve been really supportive. KW: Do you think you’re similar to your character in Lemonade Mouth? Adam: Definitely, I definitely feel in a lot of ways just because of his music that you know he likes music and I write music all the time, and he’s more of a reserved character you know, he’s chiller than Luther especially. Definitely a new character for me, I had to tone it down, and I put a lot of Adam Hicks into the character. I really feel like I did and I really made it my own. Bridgit: I think that Olivia definitely had similarities to me, I think we both love music and writing music and singing and that sort of thing, I think I definitely be shy like she can sometimes, you know I don’t live with my grandmother, I live with my parents, but I think that we definitely have similarities in our interests. KW: Adam, you wrote 3 of the songs for the Lemonade Mouth soundtrack, what was that like? Adam: It was amazing, it was awesome, when I was going out for Lemonade Mouth Disney contacted me and they were like we would like you to do music for the movie, and I was going out for the part and I got the part, I was just running around my house like, and I was like aw this is incredible, the first song they sent was determinate, and we were still in California and we just had it done the next day, and before I left from New Mexico they wanted to do a bonus scene for the DVD, so I got to do another one also. KW: I also see that you’re a multi-talented musician (rapper, songwriter), do you have any music-related projects coming up that you’re excited about? Adam: I’m doing a song right now, a summer time anthem for Disney called Burn It Up, and I’m doing a song for the Jabbawockeez, check it out it s the last episode, and we’re trying to start this revolution with Lemonade Mouth. KW: A lot of people may know you (Bridgit) from the Disney show Good Luck Charlie, I hear that you sang the theme song for that, when did you first realise that you were also interested in song writing and singing? Bridgit: It’s something that’s been a part of my life for a very long time, I think I wrote my first song, it was a Christmas song for our church, when I was seven or eight, and that’s just the one that I remember , I remember doodling and writing lyrics and coming up with melodies and trying to write when I was really young, but it terms of actually trying to write music that people would eventually hear someday I think I was about thirteen when I started messing round on the piano and later on I picked up the guitar, and its definitely something I’ve always liked and recently have been able to do professionally. KW: I hear you’re releasing a studio album due out next year, can you tell me a little bit about it? Bridgit: Well the thing is we’ve only just started working on it, I’ve only had one writing session so far, I of course have songs that I’ve already written, nine of them I know right now I want to produce and I have like full journals worth of songs, but my problem is I never know what’s good enough to actually try and turn into something. And I’ve written songs on my guitar so of course they’ll have a different sound once they’ve been produced and whatnot. But it is a bit more jazzy and bluesy, upbeat and fun but with some mellow songs too. KW: Who or what are some of your inspirations? Adam: My Parents, my friends, my parents especially, cause they’ve helped me every step of the way to get where I’m at and everything they’ve done for, and you know I have so many friends, great acting friends. KW: What’s your favourite acting project you’ve been involved with so far? Adam: I love all my projects in different cause they’ve all helped me open up as an actor and grow as an entertainer, Lemonade Mouth was great cause I put acting and music into it, but Zeke and Luther I love it, I love all projects! KW: What is your favourite part of Lemonade Mouth? Adam: My favourite part of filming and on-screen is the Madison Square Gardens performance, it was amazing, we had like 75 foot monitors behind us and cameras that would like swoop into your face and like shoot in the air and just to film it like the adrenaline it was hard to match. Bridgit: The cool thing about the story is Disney was able to make a movie about music without it having to be a be a musical, and I think that it was really nice that they tried to have it be real music and real kids and really tell their story, how they all related to music and why. And I’m all for musicals, I think they’re super fun, but I think they really branched out and made a really cool product as a result. KW: What was the funniest thing that happened on set? Bridgit: We had a lot of funny moments off-set in terms of pranks and funny games and stuff, but there was this one day we’d been doing this freeze game off-set where we would all freeze at the same time to weird people out around us, and one day on set we decided to try it out and see how they responded, the guy who plays Len’s dad in the movie decided to participate so that was fun, and we just messed around a little bit. But you have to be strategic about how you mess around on set because you don’t want to be unprofessional. You want to have a good time. KW: Who is the big prankster out of the group of you then? Bridgit: I think probably Chris, he’s definitely up for adventure and doing crazy stuff, always respectfully of course. KW: How did you guys get along on the set? Bridgit: We all really bonded as a cast, we all love music so we all bonded over that so we all had lots of band rehearsals and they gave us time to really get to know each other. Adam: We actually went out there two weeks before the movie and we just bonded as a band, and Christopher Scott the choreographer just really helped us with our steps. KW: Will you guys keep in touch? Bridgit: We are really, you know, we are really like a band in real life whether we use the same instruments or not we all work really well together and we’re all really passionate about the project so I think that’s something we totally have a love for and in addition to that we all really loved spending time with each other. Here's Lemonade Mouth with "Somebody"! “Lemonade Mouth” Actors Talk Fave Music And More! Q&A With James Maslow From BTR!